Portadown’s 37-game season of frustration will now come down to 90-plus minutes on Saturday that can rescue the club from the risk of relegation failure. 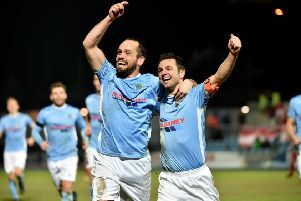 The Ports visit Ballymena United tomorrow in the knowledge that victory would cement top-flight status irrespective of other results in a battle involving four sides split by just three points. A draw would turn focus to Warrenpoint Town’s home date with Dungannon Swifts plus the meeting between basement side Carrick Rangers and Ballinamallard United, the latter below Portadown by a single point. An extra point for the Ports and Warrenpoint win would place both sides on a 36 tally, with Ballinamallard clear of the pack by beating Carrick. Portadown enjoy a goal difference superior by two entering the closing weekend but having scored on three fewer occasions compared to Warrenpoint. Pat McGibbon - the Portadown caretaker manager - is refusing to get caught up in the numbers game and insists the players must focus on deciding the club’s destiny at Ballymena. “It comes down to one result and now is the time for the players to produce,” said McGibbon. “It is about pride in the club and individual performance levels on the day. “We, as a management team, have talked about the importance of the match but it only comes down to those players on the pitch. “They must forget the problems of the past and whatever else has gone on across the previous 37 games. “It is now just about Saturday and no player wants to have relegation on his record. “We know the players have been able to produce in the past and when I stepped into the interim position after Ronnie McFall’s resignation I took a look around and felt there was quality in the squad. Chris Ramsey will miss the game due to suspension, with work commitments expected to keep Philip Lowry out of the country. Garry Breen and Ken Oman will both face fitness tests before Saturday.